In a month where we are experiencing profound changes and a complete rebirth of both our physical bodies and lives, we are about to welcome the stabilizing frequencies from the Equinox, as the Sun continues to travel around the zodiac, entering into Aries, together with a loving Full Moon at 0 degrees Libra, all happening in the same day, on March 20. During the first week of the month we received unique frequencies to support us in our journey of constant descension and emotional release, for Pisces energies are meant to end both a micro cycle in which self-liberation is pivotal, and a macro one of slavery and attachment to what impedes us to evolve. During this second phase of this month, we are going to be blessed with harmonic frequencies, for us to balance the change that we have anchored within and in our physical reality. This new light brings healing, and hence the subsequent balance, in ways we cannot imagine, if we know how to align with it, and if it is meant to occur for our unique soul journey. It is a light that will bring into the surface everything that is not vibrating in the same frequency that the dimensional space in which we dwell now. At a collective level, they will feel this profound shift as a deep breakthrough, especially for the ones who have chosen to step into this path, for they will begin the process of alchemical mutation, that we all have to pass, if they truly desire to release an old self, and the wounds that are embedded deep within their mental and emotional bodies. At a cosmic level, on March 20, we pass now from Dreamy and Intuitive Pisces to the Fiery realm of Aries. We have been working on purifying ourselves as well as our physical bodies while we dwelled in this healing Water sign - fulfilling our soul contracts, releasing emotional wounds and ending a karmic cycle, as we prepare ourselves for a new phase. For it is with Aries, the first sign of the zodiac, the Initiator, that we begin to navigate again through the zodiac wheel, by holding now a higher knowledge of ourselves and unique mission. As the Moon quincunx Uranus, this will be an opportunity for us to make the necessary adjustments for our bodies as well as lives to be fully aligned with the frequency we are currently choosing. This is one of the events said to be a chaotic one. As I always say, energies simply are and it is our responsibility to connect with them, dissolve all human beliefs, in order to see and embrace their true essence, so we can embody and direct them, for our unique purposes. Furthermore, we have another important cosmic event, at the Moon time, that will help us becoming creative channels, as we have Mercury sextile Saturn, which is going to help us in expressing ourselves through creative communication - obtaining clarity of thought as well as to ponder about our journey. It is important that we obtain clear insights about our path, through deep communion with our soul, before we impulsively create outcomes that are not going to be aligned with who we are now. This is indeed a Moon that brings cardinal energy, and hence, we are invited to act, but with the proper discernment not to create from a space of mental confusion, and delusion, which is what brings results that are not one with our soul desires. This is a Moon that will be emphasized by the Equinox's Light, whose frequencies can bring into the surface many things that our human self have not confronted/unified yet. However, all we experience is another step forward within our evolutionary journey, and even though sometimes it can be challenging, all leads us to our true destiny and potential. For the ones who have already passed this phase of deep emotional release and have obtained clarity about where they should bring into fruition next, this will be a very creative passage to commune with our souls, regain ancient memories and as this is a Moon, in which communication, and hence expression, is pivotal, the retrieval of our cosmic lineage and hence, light language, will be something that many will experience, as a sign of the new wisdom integrated with the recent energies. Remember that outside our universe and the planetary astrological events happening within it, in the macro this new light, from this second harmonic universe, brings the remembrance of our Anuhazi forefathers as well as the wisdom within it. For we are now closer to the Illumined Realms that gave birth to us. As we continue our journey of conscious evolution through this endless galactic spiral, the ones who have chosen to be on this devoted path, will begin to remember more and more their true origin, although this is always One for All, as we all descend from the same Source. At this time many, with the powerful influx from this Equinox and what its light brings, will begin to reconnect with their ancient memories, and language, from their original civilizations, for even tough many of us are cosmic travelers, most of the times, there is a specific essence, which many call home, that resonates more with us. As you know the first spoken language within our Universe was the Anuhazi language, coming from our feline Lyran ancestors - seeded by the Elohims. A connection I always have very present, but especially at the time of writing this aticle for All. For this was the main essence/message, I was guided to put into it, one of conscious remembrance, love and joy for all we have achieved, mastered, and continue integrating. Since we dwell now in a higher dimension, closer, in frequency, to the Illumined Realms, many will begin to reconnect with their original heritage/language, which for the majority is the Anuhazi one or variants of it, bringing deep remembrance of who they truly are. The Anuhazi language is a one that brings great healing, memories of our forefathers, and own experience in this civilization, which was the first one of our Universe. Astrologically, this cosmic gift is marked by Mercury conjunct Neptune, which is an alignment for us to begin working with how we express ourselves from the micro to the macro. Do we express our feelings with great love, respect, but at the same time power? Or do we speak impulsively, without measuring the impact that our words can have on others? Do we know the power of the spoken word or do we unconsciously use it? In the macro, this is going to be about expressing the love we are and feel within in a new and higher way, whether it is through light language or in our unique creative ways, for these events are also ones that will help us align with our creative expression, at all levels. It is up to us to use it to bring chaos and unlove or to bring higher frequencies through whatever it si we are guided to do, that comes from a space of love and compassion towards ourselves and All. Light language comes when we have worked on our DNA, when we are mentally stable, which can seem easy, but delusional and magical thinking is very usual within the spiritual community. It is important to understand that one is not better if one speaks light language or sing it, for we all bring an specific mission and it is not about comparing ourselves with others or with what seems glamorous to our egoic self, but about precisely embracing our unique abilities what helps All. When we are aligned with who we truly are and remain in a state of total connection with our God Self and at peace with our mind and actions, it is that we begin to remember and use this sacred language, to bring healing to ourselves, for sometimes it is just meant to help us, in our path. Others it will be directed to bring healing to All, if we are meant to share certain messages, which possibly cannot be understood, in a human way, but it is more about the frequency and vibration than about consciously understanding it. The human needs to be constantly understanding or defining things. The soul knows all, feels all and needs nothing of the physical to understand what our human self needs for our earthly path. 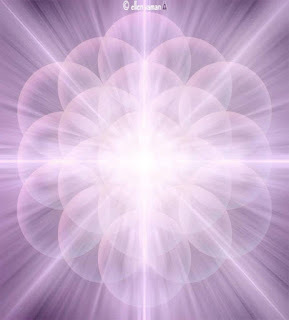 If we use the sacred sound of light language, in whatever form it comes to you, we will begin to bring back the essence, purity and wisdom of our true self and mission, for once we awake our human minds to these sacred sounds and wisdom, we are finally able to descend the Truth that has been hidden for us, for eons. We are under one of the most important healing passages of this creative year. At this time we are navigating between Piscean and Aries energies, which are frequencies of endings, new beginnings and the subsequent resurrection required to being anew. It is now that we have the gift to dissolve old traumas, wounds and everything that keeps us attached to old realities, in which we were not the person that we have now became. During this phase some of you probably have already been feeling the intensification from the Equinox Light. For others, this new frequency coming from the Illumined Realms, will bring the opportunity, and at the same time, human challenge, to test yourself and power, and for this to occur, you will need to create the circumstances that will help you to master yourself. I have received the importance that at this time working with parallel/future times has. I know many prefer the word past or future, for me, all is parallel, for as you know all is in truth happening at the same time. It is essential that as ascending souls we begin to reconnect with all the past/parallel aspects of ourselves and heal the exact timeline(s), the specific situation(s) that created the present misalignment(s) or outcome(s) that we are experiencing and that is not what we truly desire to manifest, in our current reality. We all, our Consciousness, are time-space travelers. We do not need to physical bilocate or to do specific rituals, for us to place ourselves in another timeline. We all possess this ability to correct past events, for we all are pure consciousness in motion. As ascending souls, one part of our mission is precisely to re-connect with this Consciousness within, for it is with It that we assist not just in the astral, with the unique mission each and every one of us has, but in many other dimensions. As ascending souls who are consciously walking on this path, you already know that this path is one of devotion, conscious descension and integrity. We do not simply get what we desire, or shift from one state of being to another by simply saying it or by reading spiritual material. We have to do the work, even if it involves experiencing many challenges by first hand. We have to be the ones who initiate ourselves first into a path of self-mastery and remembrance. This is why there will be many who will feel the intensity of this equinox Light as something that was hidden and hence remained unconscious, and that surface now, for them to dissolve it. This does not mean you are not ascending. This means you are given the blessing to master yourself in a physical world, so you can too spread this knowledge with All, by own experience. This is a month for us to work on so many things with Piscean energies! For some, it will be about forgiveness, for others about learning how to be compassionate, and for others about healing karmic patterns or timeliness whose consequences are still present in their current reality. Traveling to other timeliness is done by moving our consciousness, intention, and hence, Essence, to the time where the wound was created. To the moment you suffered abuse, to the moment you treated someone unlovingly, or to any situation of your human life that you desire to rememorize, bring back, and heal, with the higher perspective, and wisdom, you have now. It can be the moment when you decided to begin using drugs as a way to escape reality. It can be any other thing you used to punish yourself or simply that hurt you deeply and you are still holding this pain within. Go back to where the original wound is, feel it, and see it with new eyes, for you are not the person that made these choices. These choices were made from the state of being you possessed then, when you had another level of consciousness. Now you are a totally different person. Visualize yourself in that moment, when you first began to hurt yourself in whatever way you chose, when you first decided that you were not enough or were you, unconsciously hurt another, or made actions that were not aligned with who you have become now, ones whose consequences are still present in this moment. It is there that you have to begin the work to dissolve these choices. See yourself in the moment of making this choice and undone it. Imagine yourself pondering about the many choices presented at that time. As you know the consequences these choices will have in a future timeline, speak to your past/parallel self and recreate this past moment - making new choices, creating new timeline and aligning yourself with them, so your present results change. In the moment you chose to diminish yourself you can know choose again, more wisely, until you create a different choice, not just for your present self, but for the one who is still residing in what we call past timeline. As you proceed with this exercise, you will begin to see the evidence of the dissolution of past choices, not because they have never occurred, but because you have now created another version in which you choose to focus now - brining the personal desired shift you truly wish to experience, into this present timeline. Everything that we envision in the non-physical, from our dreams to healing ourselves, must be brought into the physical. All the knowledge we read, and/or receive from within, does not serve if we do not apply it to our physical reality. This is why many are not yet manifesting healing, abundance, or any other physical support they need, because between many other things, they are still not grounded and continue to live in the ethereal. This is a season, especially with this Equinox and Full Moon's Light for you to remember who you are, the power within and what you can do with it. For some, it will be about remembering this inner power. For others that already remember, it will be about expanding into new horizons - retrieving more wisdom from their God Self. All is equal and perfect for where we are, and need to be. Release anything that you have been told about who you are. Release old programs that wants you to keep diminishing yourself. Healing, self-empowerment and the retrieval of our sovereignty, can occur, but first we have to release all the old beliefs that tell us that this is not possible, that we are not enough, that we just have to be realistic and that in truth none of this is true. Fear is a great companion, if we know how to direct this energy, for fear as well as all of our human emotions, is energy. If we use fear to challenge ourselves to go further, to love ourselves more and to prove to ourselves, and no one else, that we are Divine powerful beings capable of unimaginable things, it can serve us to change a life, our bodies and release the undesired timeline in which we do not wish to dwell anymore. You greatest gift of all is your capacity for renewal. You are Divine Consciousness dwelling in a human body. Consciousness can undo any misalignment that is not meant to be a part of our human experience and that we have manifested, unconsciously. The power that creates worlds within you is very real. You just have to know how to align with it, for it is You, to bring the desired outcomes, and healing, that you are so eager to manifest, in your present reality. I wish you all an empowered, blessed and magical Equinox and Full Moon, Beloveds Companions!